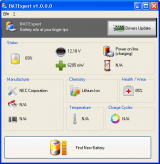 BATExpert offers you an useful sight of your laptop battery health state. It then recommends upgrade if required. The earliest indicator is related to the actual status of the battery and its charge level, followed by data regarding voltage, power (discovers if the device is actually charging), manufacturer, chemistry (discovers the kind of technology it runs on, for instance Lithium Ion) and health (in percentage, where lower values reveals questionable well-being). Additionally to these, the program also shows indicators regarding temperature, charge cycles and the remaining battery time; however, note that some of the parameters may not be obtained if they are not made available by your battery. Does not consume much system resources. The installer pack has bundles. The indicators are not clickable. BATExpert has been tested by Download82.com team against viruses, spyware, adware, trojan, backdoors and was found to be 100% clean. Our editors will recheck this software periodically to assure that it remains clean.